"Experiments directly confirm for the first time that this behaviour continues beyond the conventional limit of unity electrical-to-optical power conversion efficiency." MIT physicists have managed to build a light-emitting diode that has an electrical efficiency of more than 100 percent. You may ask, "Wouldn't that mean it breaks the first law of thermodynamics?" The answer, happily, is no. However, while MIT's diode puts out more than twice as much energy in photons as it's fed in electrons, it doesn't violate the conservation of energy because it appears to draw in heat energy from its surroundings instead. When it gets more than 100 percent electrically-efficient, it begins to cool down, stealing energy from its environment to convert into more photons. 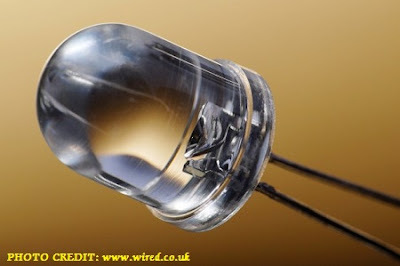 In slightly more detail, the researchers chose an LED with a small band gap, and applied smaller and smaller voltages. Every time the voltage was halved, the electrical power was reduced by a factor of four, but the light power emitted only dropped by a factor of two. The extra energy came instead from lattice vibrations. . . .
SMART ENERGY NEWS | VIDEO: Concentrated Solar Power Tower In Seville, Spain: The Future Of Electricity? SMART ENERGY NEWS | "Solar Panel Prices Have Plunged by Two-Thirds Since 2008 . . ."